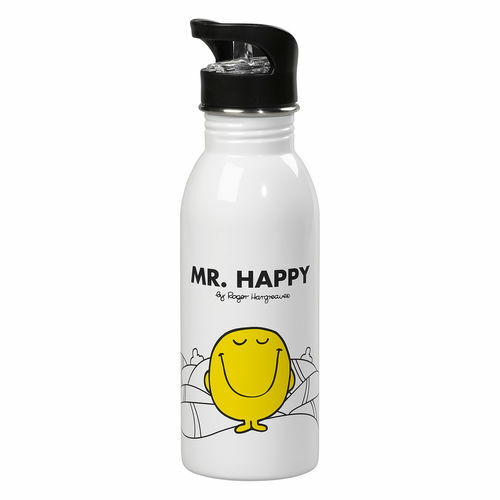 Mr Happy Water Bottle | Facing life with a smile! Facing life with a smile! Did you know water can improve your mood? And so can Mr Happy if all else fails! Who can resist his smiling face? What better way to stay happy and hydrated throughout the day than with this Mr Happy Water Bottle! You'll be happier having a drink of water to refresh you state of mind with this cute and functional stainless steel water bottle. It's bright, lightweight and great for sport or school trips, it will even keep you smiling after a hard and draining workout! "And then he chuckled, which turned into a giggle, which became a laugh. A big booming hearty huge giant enormous laugh". Bring some light, laughter and fun into your life and the lives of others! Hand wash only. Never use in the dishwasher or microwave.